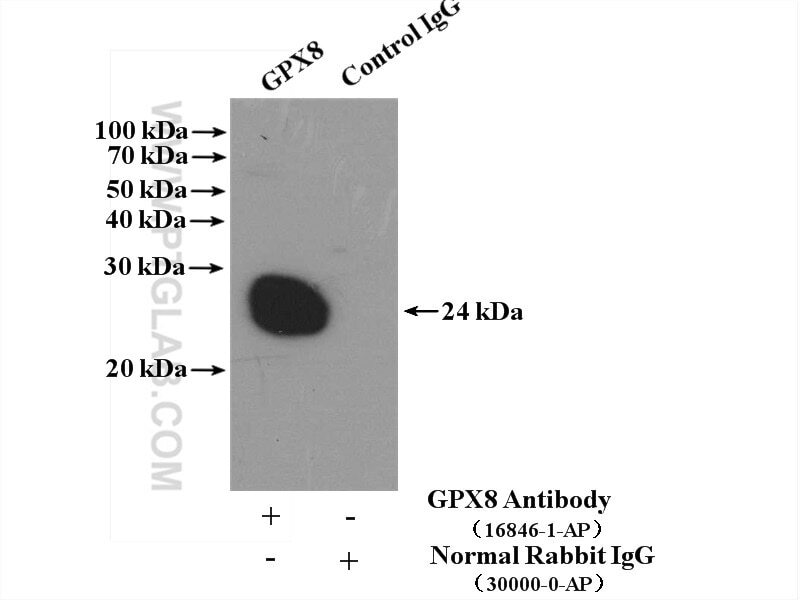 IP Result of anti-GPX8 (IP:16846-1-AP, 4ug; Detection:16846-1-AP 1:300) with HEK-293 cells lysate 3000ug. GPX8(Probable glutathione peroxidase 8) is also named as GSHPx-8 and belongs to the glutathione peroxidase family. Glutathione peroxidase (GPx) reduces hydroperoxides, including hydrogen peroxides, in the presence of reduced glutathione as a means of protecting organisms from oxidative damage. Several GPx isozymes have been identified in animal cells and these have been classified into different groups according to their cellular location and substrate specificity. In humans, eight types of GPx have been identified from GPx1 to GPx8. The full length GPX8 has 209 amino acids and the molecular weight is 24 kDa. ER-resident antioxidative GPx7 and GPx8 enzyme isoforms protect insulin-secreting INS-1E β-cells against lipotoxicity by improving the ER antioxidative capacity.